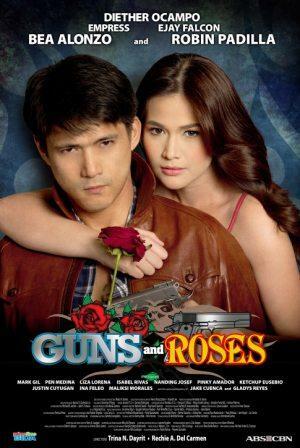 Check out this official TV series poster of the newest action-drama TV series of Primetime Bida called "Guns and Roses". "Guns and Roses" teamups for the very first time the action star Mr. Robin Padilla and the teleserye sweet heart Ms. Bea Alonzo. The hunk actor Diether Ocampo plays a third party between them. Joining Bea, Robin, and Diet are the young stars Ejay Falcon and Empress who are also paired for the first time. "Guns and Roses" are now starting to hit the Primetime. It premiered last Monday taking the No. 2 spot nationwide!